School District Grandy Elem, Camden Middle, Camden H.S. Remodeled and updated beauty nestled on a large lot within easy commuting distance to VA. Gorgeous kitchen with granite c-tops, island, breakfast bar & nook. New stainless steel appliances, tile back splash and wood laminate flooring. The great room is bright & spacious with new carpet. Separate dining room with chair molding & office boasting french doors. Master suite with large walk-in closet, dual sink vanity, deep soaking tub, tile floors. Rear deck and fenced yard. 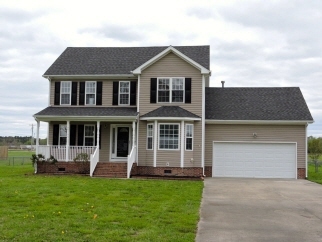 This home is freshly painted and boasts new flooring throughout.Bonus RM is 4th BR if needed. Don't miss out!